Winter is the time to get outside, not just for the activities we often partake in like snowshoeing, sledding, and snowman building. Winter is also a good time to control invasive plants on your property. 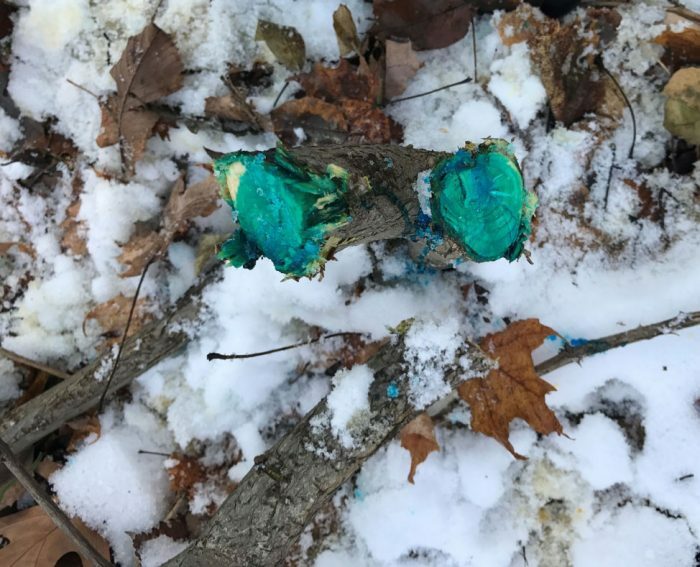 When it comes to killing woody invasive plants, winter is a reasonable time to treat. This may surprise you. While herbicide labels generally suggest that the herbicide should be used when the target weed is actively growing, this is not necessarily true for all species of plant, particularly for woody shrubs. Cut stump and basal bark treatments are two techniques that often work great in winter, particularly on plants that have an above-ground stem with live inner tissue. Weed trees and bushes all have live inner bark – the cambium layer. 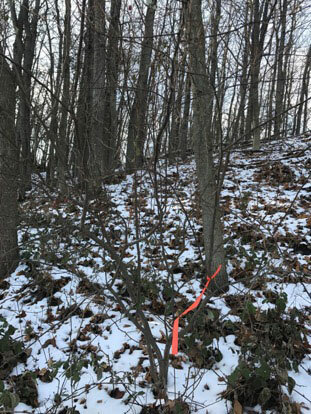 Winter treatment could be a viable alternative for controlling invasive woody species including oriental bittersweet, buckthorn, bush honeysuckle, and privet. There are numerous advantages to performing invasive species control work in the winter. Seeing and getting around is easier in winter in areas that are dense with understory growth during the growing season. The frozen soil means less harm from machinery, such as compaction of soil and rutting in wet areas. 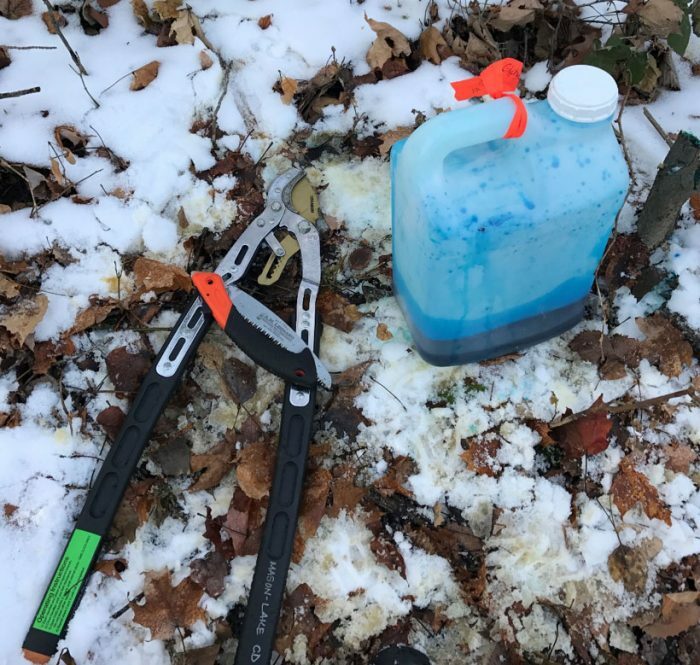 Though fall treatments are preferred, since this is when the plants are actively transporting their reserves, and hence the herbicide, to their roots, winter treatments may be an option for those that have more free time in the winter for such work. Treating plants with the use of herbicide in winter, as opposed to summer, lowers your chance of negatively affecting non-target species, since most plants are dormant this time of year. Another bonus of performing invasive shrub control during winter is that winter conditions are surprisingly more comfortable for this type of work than summer. The mechanical aspects of the job, such as hand-sawing shrubs down for cut-stump treatments, is labor intensive, and one can quickly overheat in high summer temperatures. Conversely, in winter, you can stay warm without being sweaty and uncomfortable. As an added advantage, with the cold temperatures there are no mosquitoes or ticks to contend with. When treating in winter you need to be able to identify the plant species you wish to treat. This can be difficult unless you are very familiar with the bark or bud structure of the target species. An easy way to ensure you are targeting what you intend to with your winter herbiciding is to mark the plant during the growing season with some type of flagging or tree paint. That way, when the leaves are gone, you can still be sure you are treating the right plant. Another consideration when planning herbicide applications in the winter relates to your choice of herbicide to use. Water-based herbicides are not effective this time of year because plants are not actively transporting water. One type of herbicide that may be effective during winter are those containing the ester formulation (oil-based) of triclopyr. Some name brands of products containing this formulation of triclopyr include Garlon 4A and Pathfinder. Of course, which chemical you decide to use should also be dictated by what species you are battling. It is best to consult a professional for advice on which chemical to use, and what technique to employ. The North Country Cooperative Invasive Species Management Area (NCCISMA) staff can provide such expertise. To get in touch with NCCISMA you can stop into your local conservation district office, or contact NCCISMA directly by stopping in at their location in the Wexford County Courthouse, by phone at 231-429-5072, or email vicki.sawicki@nullmacd.org. The judicious use of the right herbicide can save years of repeated mechanical control of persistent plants. Keep in mind that when it comes to herbicides, the label is the law, and it is your responsibility to use chemicals according to label directions. To learn more about NCCISMA and the services they provide visit their webpage at NorthCountryInvasives.org. 1.) The invasive shrub should be marked with flagging during the growing season, that way when the leaves are gone, you can still be sure you are treating the right plant. 2.) Winter treatments don’t take much equipment, just need something to cut through the stem, a pair of loppers or a small hand saw are what are commonly used. 3.) The invasive you wish to treat should be cut slightly above the ground and the herbicide applied directly afterwards. For better visibility we add blue dye to see where we have treated.